He knows it’s not much but it’s okay – Abz from the late 90’s pop phenomenon boyband 5ive has apparently fallen upon such hard times that he’s been forced to sell the group’s Brit Award to the highest bidder. To be fair, Richard Abidin Breen, aka Abz Love, is actually making something of a comeback since he and the other lads from the rap-pop outfit fell into obscurity after their split in September 2001. Breen is now starring in his own BBC2 reality show Country Strife: Abz on the Farm, after he and his partner relocated to rural Wales. However, their dreams of owning a smallholding has hit a bit of a snag as they’re somewhat strapped for cash. 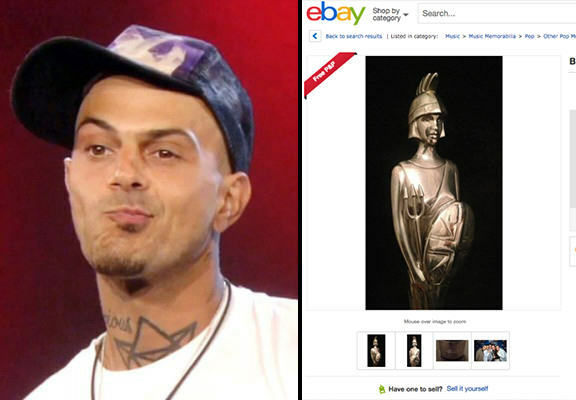 So Abz has stuck his 2000 “newcomer best pop act” Brit award on eBay to “fund a delivery of topsoil and maybe some garden tools”. We guess poor Abz didn’t earn enough when he donned the khaki suit again in 2013, as the group briefly reunited for a comeback tour as a four-piece, still confusingly calling themselves 5ive. You are viewing one real deal Brit award for newcomer best pop act 2000 awarded to Abs ex Five rapper, star of hit BBC2 show ‘Abz on the Farm’, Big Reunion and runner up CBB12. No more awkward silences when people come over to your house!! This is a real conversation piece even if you didn’t win it! Guaranteed 100% real. Take advantage of my poverty and grab this rare opportunity to own a bit of pop history!! Has been dropped and knocked a few times and is currently being used as a door stop. Has been held by Jason Statham although I can not prove this. It’s a timely reminder that even after the fame subsides, these guys have just got to keep on moving. And the statue is doing some great business so far – bids have risen to a whopping £1MILLION+ on the statue. Wow. Bids close on Monday 14 September and you can bid for the trophy on eBay here. At this rate, Abz will be able to afford a heck of a lot more than some tools and topsoil! We just hope the bidder is legitimate… Or do we?